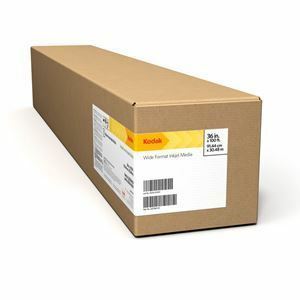 KODAK PHOTO TEX Repositionable Fabric / Aqueous sticks to any non-porous flat surface and removes easily with no residue for sharp looking, seamless graphics and superior photographic images every time. KODAK PHOTO TEX Repositionable Fabric / Aqueous is ideal for life-size photographic cut-outs for walls and wall murals. It also works great for a variety of indoor and outdoor applications, including windows, backlits, doors, sign boards, and other flat surfaces. The adhesive is removable, reusable, and repositionable. It does not remove paint from a primed wall, is safe to apply over wallpaper, applies without wrinkles, and does not rip. This version of KODAK PHOTO TEX Repositionable Fabric / Aqueous is compatible with both piezo and thermal printhead technologies.